Colicky babies are tough! The poor little tikes are unsettled and the crying and screaming also causes terrible stress on mum and dad. 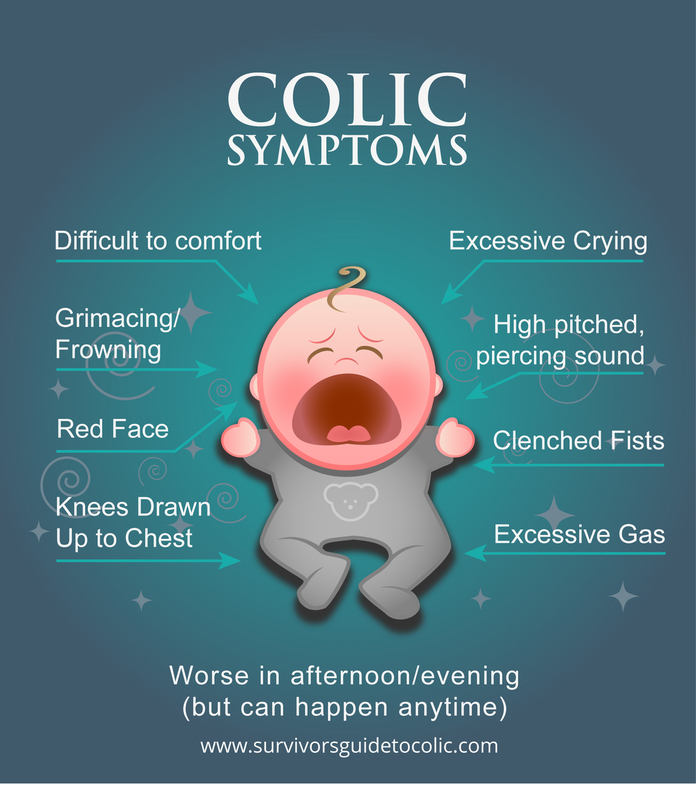 Learn the symptoms so you can tell if your baby is suffering from colic: Crying that is a high pitched, ear-piercing sound; Grimacing or frowning face, with a pained expression; Red, flushed face; Clenched fists; Excessive gas (flatulence, farts, farting a lot, explosive farts or baby farting); Knees drawn up to chest; Baby looks like she or he is in pain; Often worse in the afternoon or evening (but can happen at any time). Babies with colic are very difficult to settle with cuddling or soothing and are often described as fussy babies or difficult babies. Most new parents anticipate that the reality of a new baby will be quite challenging, but few people are prepared for a baby that cries inconsolably for hours. A baby whose needs have all been met, but is still screaming that ear-piercing wail, with fists clenched, knees drawn up tightly and a terrible grimace on his/her little face. Estimates of colic vary widely from 5% to up to 40% of babies being affected, but most experts will accept a middle ground figure of around 20%. That's one in five babies screaming for hours at a time. The sound is heartbreaking and being unable to comfort your own baby is intensely stressful for parents. The main symptom of colic is excessive crying that lasts for prolonged periods, in a baby that is otherwise healthy and has had all his/her needs attended to. Babies with colic are very difficult to settle with cuddling or soothing. There are other medical conditions that can cause excessive crying in infants, so it is important to see a doctor to rule out any other underlying medical condition, before assuming that your baby has colic. However, other medical causes account for less than 5% of infants presenting to their doctor with excessive crying. If your baby is in the other 95%, the Survivor’s Guide to Colic can help! Concerned about the impact of the crying & stress on your relationship. Colic does not happen because your baby has a “difficult” temperament. Jen's recent blog "Common Colic Worries" covers some of the concerns parents of colicky babies often have and some reassuring scientific research that puts those worries to rest. When you are a tired parent of an unsettled baby, it seems like all the information out there is conflicting and inconsistent. The experts argue about everything from the cause of colic to how to treat it. There are so many colic-related products on the market that it is really hard to figure out what's real and what's just marketing hype. And then there's the urban myths, the 'old wives tales', the out of date information and some other stuff people have posted on the web that's just plain wrong (and sometimes dangerous). It can be incredibly frustrating when all you want to do is help your baby. One reason for the conflicting information is that there is fierce disagreement between experts about what causes colic and how to treat it. It is also complicated because different babies respond to different techniques/solutions. In brief, some experts believe that colic is caused by a gastrointestinal issue and others believe it is caused by environmental factors such as overstimulation or the need for more advanced settling techniques. As a result, different experts believe in different solutions and have a tendency to argue that they have the 'right' solution for colic. That is a very confusing maze for an exhausted parent to navigate. Jen has written you the book that she wished for as a new parent of a colicky baby: a book that gives parents clear and balanced explanations, practical tips and solutions, explains why some experts have different opinions and backs it all up with references to the relevant medical research. any medical evidence to back up each viewpoint. After reading the book, you'll understand the pros and cons of each of your options, which will empower you as parents to find the right solution/s for your baby.